Big females are moving up! With a couple big cold fronts approaching, the big female bass are feeding before the spawn. 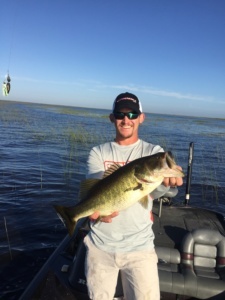 Target outside reeds and grass with swim jigs and spinnerbaits. White, chartreuse, black and blue have been the most productive colors. The fish are grouped together this time of year so cover water until you find a quality bite or two, then slow down and take your time picking these areas apart. If your looking to get away from the cold and enjoy the beautiful Florida sunshine be sure CLICK HERE to book your trip today.